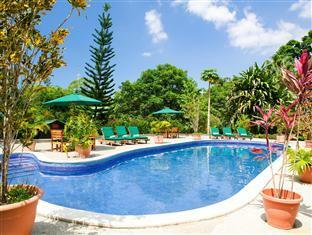 ﻿ Best Price on The Lodge & Spa at Pico Bonito in El Pino + Reviews! Spectacular waterfalls, a landscaped swimming pool and rainforest views are featured at this luxury complex in Pico Bonito National Park. Each charming cabin has a private porch with a hammock. Guests can explore jungle trails with trained guides at The Lodge at Pico Bonito. The nearby Cuero y Salado Nature Reserve is home to rare manatees, monkeys, sloths and over 400 exotic bird species. Rafting and horseback riding can be arranged at Pico Bonito. Guests can also try snorkeling at La Ceiba, only 8 miles away. An iPod dock and a coffee maker with organic Honduran coffee are provided in each cabin at the Lodge. All cabins have a private bathroom and a ceiling fan or air conditioning. Meso-American dishes made with local products are served in the restaurant, which overlooks tropical gardens. Breakfast options include eggs and bacon, French toast with fresh fruit or typical corn tortillas. this was an absolutely perfect stay. from the staff to the food, from the turn down service to the nature trails, every aspect was amazing. i can't recommend staying here enough. i saw more beautiful birds in this one night stay, than i have in my entire life. be sure to try the pico bonito rum drink and the seafood soup, they are both so delicious!